Why are such happy stairs and happy words causing such division in our community? 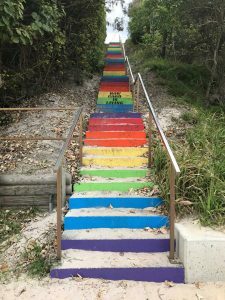 If you walk around Rainbow Beach – you’ll know that there is a rainbow-painted staircase from Laurie Hanson Park to the patrolled beach. And you’ll see that four words have been added, “How good is living”. What started out with good intentions has turned into a battle, and a segment on national television. The Rainbow Beach Commerce and Tourism Meeting minutes, held April 5, 2017 at Cafe Jilarty, included “endorsement” from Cr Mark McDonald. Motions were carried, “That RBCT members paint the stairs in the 7 colours of the Rainbow” and “That RBCT members contribute funds to purchase the paint and equipment.” Various members volunteered to buy a colour, so purchase of paint and equipment could be arranged. However it wasn’t until May 18, 2018 the stairs were pictured on the Team Rainbow Facebook page as a “Legacy from Australia’s first Pride House” and “Donated PUBLIC ART … classified as now through Qld Govt”. Said Cr McDonald,”Team Rainbow said I gave permission – that’s not true. A member of Team Rainbow called me and I directed them to go through the CEO.” Cr McDonald said he also sent an email. On June 1, the words, “How good is living” were added. “Painting Rainbow’s stairs in rainbow colours – is a good thing. But, ” Cr McDonald was clear, “both sides have painted Council property without permission. Council has met with both parties to resolve the situation, however Cr McDonald says neither party would give an inch. They have offered an entry statement to town (with the text) and the offer was refused. He is concerned that a ratepayer asset has caused such angst and has said they will remove all paint and return the stairs to their former condition if parties cannot agree and keep incorrectly quoting and blaming Council. “We can appreciate rainbows symbolise gay pride, but that is not what Rainbow Beach is all about either. Rainbow is a great town to live in, a great town to visit – that’s the message we need out there. The stairs belong to the community – one hundred percent. “Whoever walks down the street – they do so with equality, now. Rainbow is an extremely liberal town, accepting people of all colours, creed, religion and sexuality every day. We welcome thousands year-round. An aim of creating the rainbow stairs was to “raise the profile of Rainbow Beach” . Team Rainbow also claim the steps as “the first in Australia”, and that ” the vandalism is provocative and confronting to people with suicidal tendencies”. So this is really one vandal complaining that someone else vandalised his work. Really petty! Our kids are watching…. This is getting silly …. Leave it all the way it is …. How awesome, uplifting, encouraging and engaging! Great words in this time of world when so many people find it a struggle to face another day. Such a to do over nothing! ..to claim inclusivity yet won’t include and embrace others work to help improve their own reeks of exclusivity. I love it and my family loves it and so do “all” of our domestic and international visitors I take past it daily. …how is this uniting the community? Small town politics need to be put aside and embrace what has been a positive response from tourists. Painting a rainbow on a public stairwell is hardly unique art, a rainbow is not a copyright or trademark, nor is it exclusive in meaning or intention. I recommend your next project is building a rainbow bridge (and getting over it). Sign the petition to keep the words: www.change.org/p/gympie-council-how-good-is-living? Should there be a Seafood Festival?